Dimensions 1.25 by 12 by 9 in. Fish & Game restaurant in Hudson, New York, is a leader in the local foods movement. Its core approachâengaging intimately with nature both wild and domestic, building relationships with farmers, and exploring the joys of fermentationâis one of interest to anyone, anywhere, who yearns to cook and eat better food. Established in 2013, Fish & Game, with its chef/owner Zakary Pelaccio and his co-chefs and partners Kevin Pomplun and Jori Jayne Emde, is already receiving national accolades and honors, including the 2016 James Beard Award for Best Chef: Northeast; 2015 James Beard Award finalist for Outstanding Restaurant Design; 2015 & 2016 Wine Enthusiast: America's 100 Best Wine Restaurants; and 2014 James Beard Award semifinalist for Best New Restaurant. 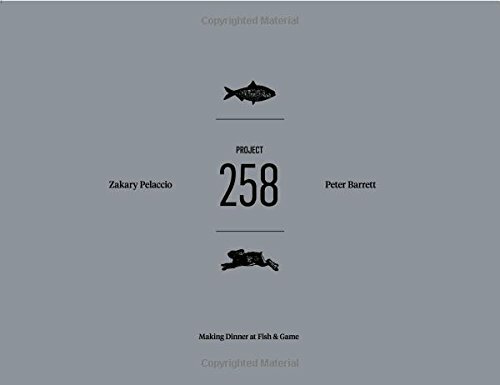 Project 258: Making Dinner at Fish & Game presents an enticing selection of seasonal recipes, profiles of key producers who supply the restaurant, and a fascinating, beautifully illustrated look at the processesâboth intellectual and culinaryâbehind the food at Fish & Game. Taking no shortcuts, Pelaccio and his staff handcraft many staple ingredients, including fish sauce, vinegars, maple syrup, and prosciutto. He explains how the methods and techniques practiced at Fish & Game can be applied to the food that grows wherever you live. If you ever wonder "what does this place taste like?," let Project 258 be your guide and inspiration for locally based food sourcing and eating.